Are you proud of Liverpool but unsure how to show it? Do you look at holidays like St Paddy’s Day and Burns Night with an overwhelming jealousy? Fancy a pan of scouse and need an excuse to eat more of it? Then you’ll be made up to discover that Friday 28th February is Global Scouse Day. A day dedicated solely to the culinary success that is scouse. How boss is that? And taking part couldn’t be easier. As the event’s very own website declares: “just ‘ave yerself some scouse”. It’s the brainchild of local film-maker and video-director Graham Hughes who set off around the world in 2009 with an ambition to make a world record and returned in 2012 with the idea for Global Scouse Day. Oh and the Guinness World Record for having visited every country in a single trip without flying. The idea was a very simple one: a day to celebrate and enjoy the stewy deliciousness of scouse. What started as a get-together of friends in Graham’s kitchen with a solitary pan of scouse has boiled over on a city-wide scale, with restaurants, bars and cafes putting scouse on the menu and running various events and competitions. 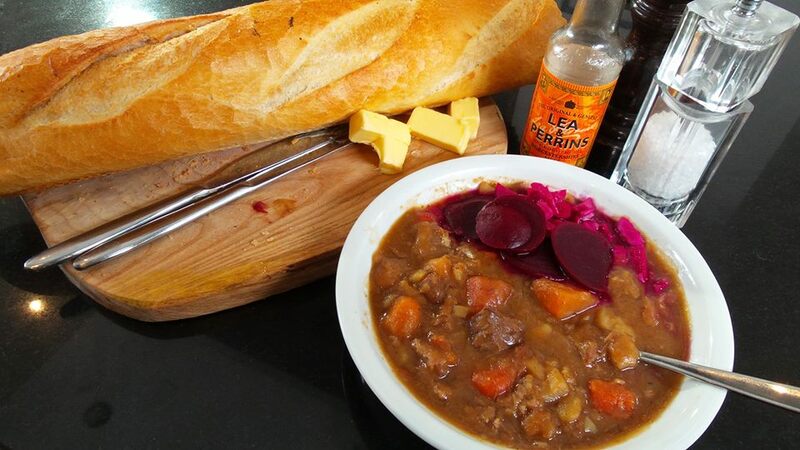 Turning up the heat on Global Scouse Day is the more recent Project Scouse: a group of individuals promoting all things scouse, from culture, heritage and more importantly, food and drink! One such individual who has been with both projects since their inceptions is Laura O’Connor, or as she’s better known in the Liverpool foodie world: Laura from Laura’s Little Bakery. “It was myself and Dave Critchley (head-chef at The London Carriage Works) who founded Project Scouse. It stemmed from our friend Graham’s trip around the world. “He commented that there’s always a scouser that pops up no matter which country you find yourself in and that’s where the idea came from”. And what about Graham’s inspiration for Global Scouse Day? “We contacted local businesses to ask if they would put scouse on the menu on 28th February. In turn me and Dave got talking about the origins of scouse and started Project Scouse two years ago”. And Liverpool’s restaurants and eateries have certainly warmed to the idea, with the likes of Fredericks, Alma de Cuba, Marina Yacht Club, Lucha Libre, The London Carriage Works and Almost Famous just a handful of establishments keen to show the world their version of scouse. While we all quibble over whether the perfect pan should have beef or lamb, there’s plenty happening on Global Scouse Day to suit the fussy eaters who’d sooner turn their nose up at the meat and veg concoction. What is a scouse cocktail? A “Bloody Merrrrr-der”? A “Kenny Court Special”? A “Mann Island Ice Tea”? Entry is free if you think you’ve got what it takes, but ingredients must be local and sourced within a 20 mile radius. The day has certainly got the city’s restaurants excited and there’s every opportunity to treat yourself to a hot pan of scouse; whether you’re at the kitchen table tucking into your ma’s home-made or eating out. And you don’t have to be native to get involved. Japanese restaurant Etsu, Beetham Plaza are joining in and serving up what is sure to be an intriguing take on the Liverpool dish. But while Global Scouse Day has certainly cooked up a buzz in and around the city, there is a sense that there is more to the day than just inhaling a hearty bowl of scouse. Laura and co started Project Scouse to encourage the growth and success of independent businesses in Liverpool, and this community spirit is at the heart of Global Scouse Day. Wherever you are on 28th February, raise a bowl to your culture, your heritage and to those sailors who helped put scouse on the world menu. kroberts is My name is Kevin I am a member of your Halls Student Experience Team. Please feel free to drop me a line if you have any questions about the activities and experience we provide here at the University of Liverpool Halls.